Senator Ovie Omo-Agege has gotten the backing of the court who has ordered Senate President Bukola Saraki to do this for the lawmaker. The Federal High Court on Thursday warned the Senate President, Bukola Saraki, over the imprisonment proceedings initiated against him by the Delta-Central senator, Ovie Omo-Agege, Punch has reported. 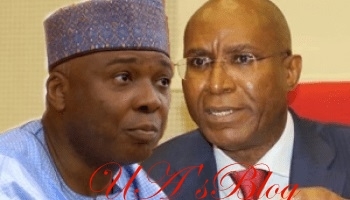 Recall that Omo-Agege had initiated the committal proceedings praying that Saraki be sent to prison as punishment for flouting the May 10 judgment of the court which ordered him (Omo-Agege) to be reinstated from illegal suspension and be paid all his accrued benefits for the period of the voided suspension.